Many people are going into survival mode and packing food, water, and other necessary supplies in kits to ensure their well-being. If and when something should happen, you want to be prepared. 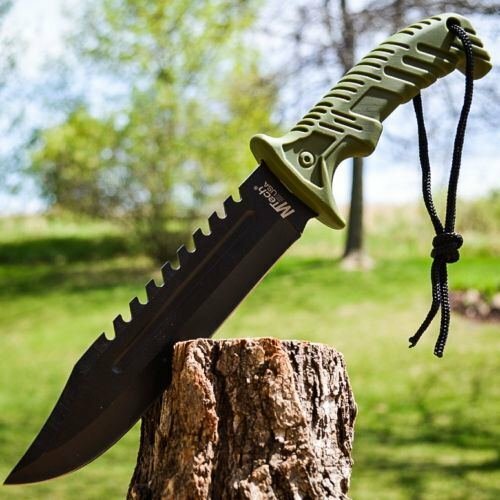 One thing you may or may not have considered is having a survival knife in your preparations. Here are the top 10 on the market that will enhance your chances of making it should you find yourself without food and or needing to protect yourself. 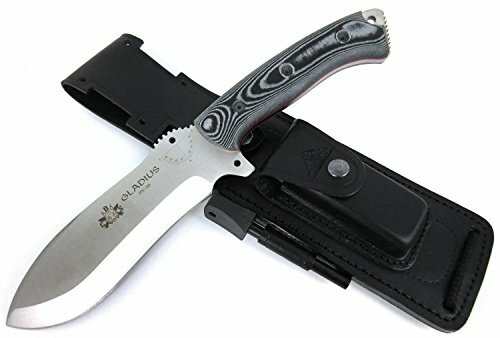 This knife has a fixed blade. It is a 3-in-1 heavy duty full tang knife. 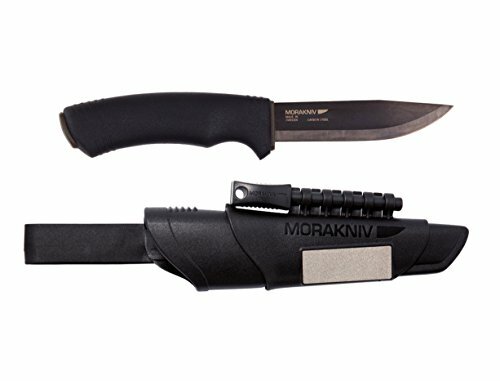 Whether it is for hunting, fishing, or just to add to survival kits; this durable knife will impress. It is 8.46 inches long and has a handle that is 4.29 inches. This knife also comes with a mini flashlight and a fire starter too. If you’re looking for something for emergency preparedness; look no further than BlizTec’s top of the line. Because the craftsmanship is solid, this knife comes with a lifetime warranty. 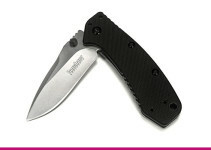 This partial serrated edged knife is just what you need. StatGear ‘s Surviv-All knife is made from a high carbon. It is a 440 stainless steel full tang, which also has a drop point blade. Customers rave about the rubber textured handle that allows gripping to be done with ease. The dimensions are 9.5 x 2.5 x 2 inches. It weighs 15.2 ounces, and is light enough for easy transport. It comes with a 90 days manufacturer’s warranty. This kit comes with a fire starter rod and cord cutter. It is great so you don’t have to take the knife out for smaller cuts. Made from high carbon steel, this knife comes with a sheath. It weighs 15.9 ounces and is 8 x 5 x 13 inches. 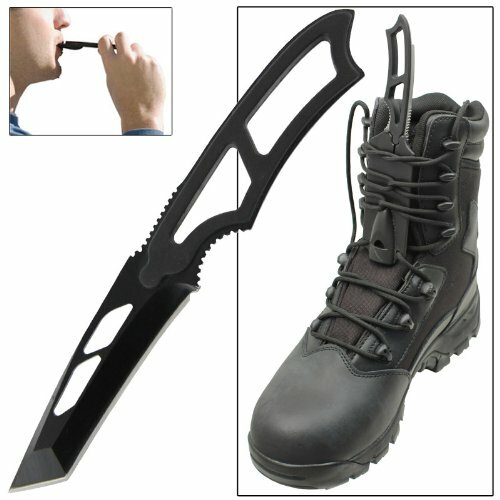 It is a fixed blade knife that can be used for the right or left handed person. It has a limited lifetime warranty against any defects in the craftsmanship. 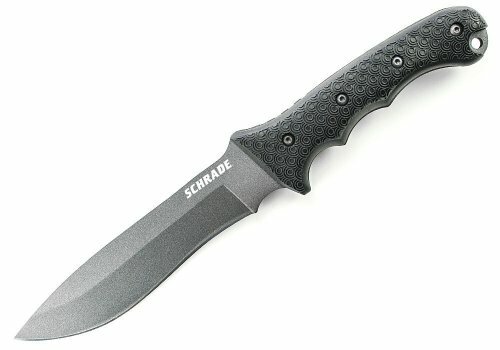 This is a tough, hefty duty workhorse knife. It has a TPE rubber scales and a lanyard hole for convenience. You must be 18 years of age to own this knife. This anodized aluminum knife is so sharp you can shave with it. 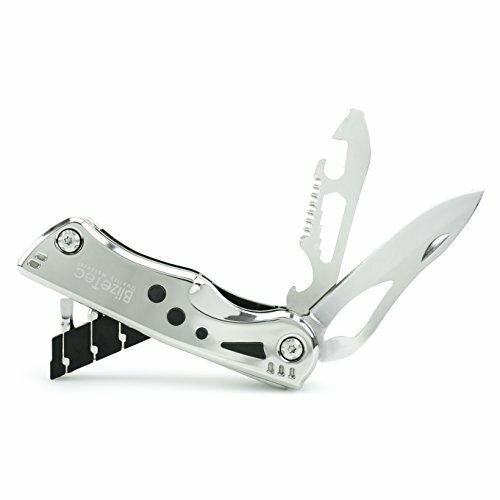 It’s a multipurpose tool that has a fire starter, window breaker, seatbelt cutter, LED light, and, of course, the knife. It has a firm locking mechanism that can be released with a push of the thumb. 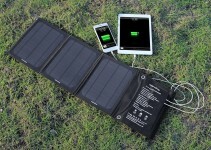 The batteries will last up to 12 hours, which is great if you are in survival mode. It has a belt clip so the knife can be carried with ease. It’s lightweight at only 5.6 ounces. The nylon carrying case is an additional touch that is perfect for protecting the knife. What’s great about this knife is that it is not going to break the bank. It is a 7″ stainless steel blade that has the ability to slice evenly every, single time. It’s a nice army green color that has controlled precision. The blade can be res-sharpened with ease over and over again. It doesn’t do anything fancy and doesn’t have any fancy 5-1 attachments; but it’s a great knife. The handle has a rubber coating for comfort, and it comes with a lanyard cord. Priced at $11.75, it’s a steal. There are knives and then there’s the CDS-Survival MOVA. This knife is superior in all aspects. It has a Cocobolo wood handle, genuine leather sheath, and comes with a sharpener Stone and fire steel in this package. This handmade knife is cut by a laser where attention is paid to detail. Whether you’re chopping, splitting, or doing fish cleaning; this knife is supreme. This knife has a nice 90-degree blade spine, which is perfect for whatever you need. Don’t be fooled by others on the market; this one is what you need to survive. While this knife is inexpensive, it does provide something that the others don’t. It fits comfortably inside the boot area and doesn’t need to be carried on the belt. That means that in a battle to survive, the enemy won’t know its present. The blade is 3 Inches long and it is made from anodizing 440 Stainless Steel. It comes with a hardcover sheath and also a whistle. The 35 inch Para Cord is also a nice touch to this exceptional knife. When buying survival gear, you can spend as much or as little as you want. 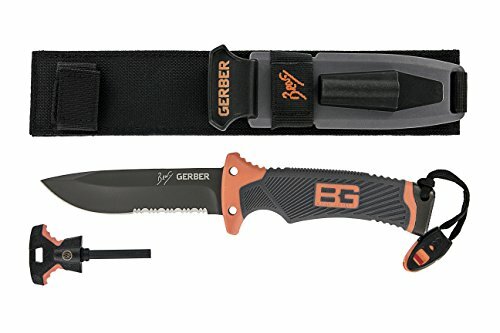 This Gerber knife is an example of how you can pay a little and get a lot. First, as a nice touch, the knife is always sharpened and ready to use. It has a built-in sharpener in the sheath. Just pull it out and its ready to go. The premium steel knife comes with a fire starter and a lanyard whistle. It’s a nice orange color for quick identification and it is 4.8 Inches long. A knife that will last for years and never let you down. 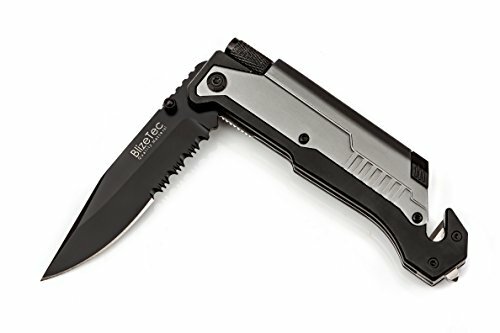 Gerber is known for their quality products in the survival business, and this knife is no exception. It has a molded rubber grip and knurled striking surface, and also comes with a whistle too. The knife has a fixed point and has a sharpener in the sheath. It is 10″ in length and weighs 1.2 oz. 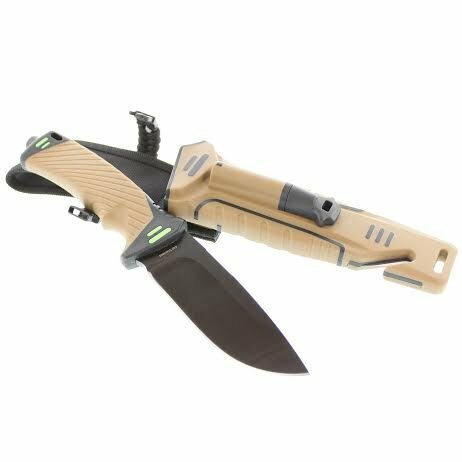 This knife is meticulously designed to meet the needs of the survivalist who doesn’t want to spend a fortune for their gear. 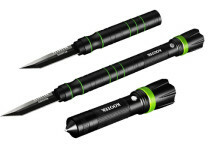 This indispensable tool is perfect for any tactical application. It is made of high carbon steel and it is known for its durability. This razor sharp knife is 3.2 mm thick and has an anti-corrosive black coating. The grand prevents the knife from slipping and since it is a nice 4.3 inches long; it’s a necessary feature. The black sheath holds the knife and the fire starter, which is also included. The striker plate will last for about 7,000 strikes even when wet. Knife will need to be oiled after each use, but it’s got a lifetime warranty against manufacture’s defects. These 10 options are well prices and perfect for all levels of survival. 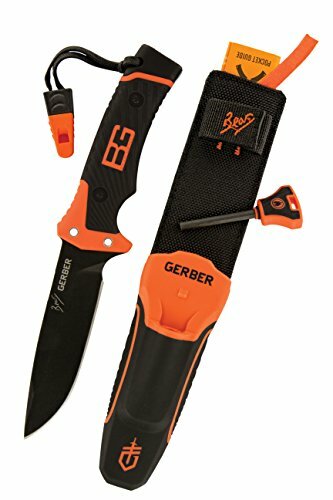 From the expensive knives that the elite want, to those basic starters that are great to add to the collection, there is something in this list for everyone. Being prepared in case of an emergency situation is invaluable. Because you never know when a knife and basic skills will save your life.